And Guest Wisdom Keepers Ram Dass and Zalman Schachter-Shalomi. via exclusive and inspiring pre-recorded talks & conversations. 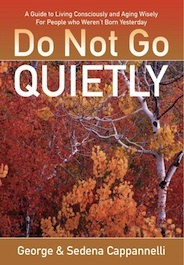 In this engaging, joyful and transformative multiple day program George and Sedena Cappannelli authors of Do Not Go Quietly, A Guide To Living Consciously and Aging Wisely, winner of nine national book awards, and two of the country’s leading experts on the second half of life and their special Guest Wisdom Keepers, Ram Dass and Rabbi Zalman Schachter-Shalomi who will join via exclusive pre-recorded video conversations, will guide you on a remarkable journey of self-discovery, inspiration, healing and deeper connection to the dreams you came here to manifest and the life you were born to live. Harvest and honor the wisdom and experience of your past and turn it into the gold of greater consciousness and passion that you can invest in each present moment. Use this wisdom and experience to chart a remarkable, sustainable, more passionate and loving course for the future. Remember that you are never too old or too young to manifest the dreams you hold in your heart. Chart a inspired course for your future and a legacy worth sharing. Practical, relevant and powerful tools, inspiring stories, transformative, enlivening interactive processes, special Enlivened Aging strategies and heart opening experiences and connections with others – all designed to assist you to live with greater passion, creativity, purpose and joy, to create a legacy of genuine value and to accept and greet each stage of your life, even the last, with greater curiosity, acceptance and genuine engagement. 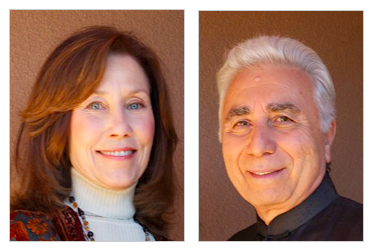 George and Sedena Cappannelli are world-class experts on societal, organizational and individual transformation and among the countries leading experts on living consciously and aging wisely. They are co-Founders of AgeNation, an organization dedicated to bringing inspiration, education, engagement and solutions to people who weren’t born yesterday and members of younger generations who want to know more about the world they will soon inherit and Empower New Mexico, an affiliated 501C3. They have two national radio shows, AgeNation Radio Magazine, co-hosted with Alan Hutner and Conversations With The Wisdom Keepers. They have launched The World Council of Wisdom Keepers with some of the leading authors and experts or our time and the world-wide Elder Studies Degree and General Studies Curriculum and The Elder-Corps™ in partnership with The Wisdom School of Graduate Studies at Ubiquity University.